DIE #1 sets up something special. Fantasy is often used as an escape. But what if you couldn’t escape fantasy? 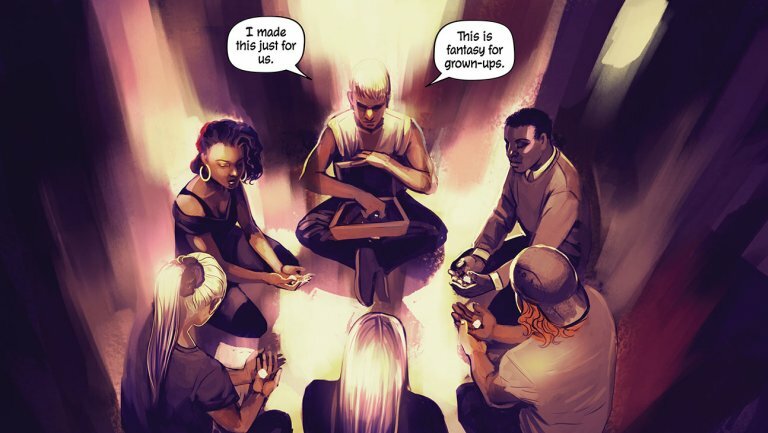 Published by Image Comics, Kieron Gillen (The Wicked + Divine) and Stephanie Hans (Batwoman) have teamed up for the upcoming DIE to tell a story of a group of friends in the 90’s who – for different reasons – play tabletop RPGs. When the group is literally sucked into a new game they’re trying, thanks to a magic die, mysterious, awful things happen. Decades later, the group is forced to revisit the game and attempt to fix some of the mysterious terrors that occurred while inside. Per usual, Gillen’s work in the fantasy genre is stellar. 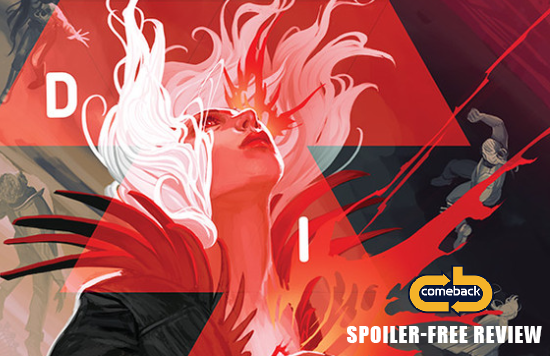 While The Wicked + The Divine (which Hans did covers for) masqueraded its bleakness with bright, flamboyant color and eccentricity, influenced by pop music and divine mythological deities, DIE is a much more grounded story about friendship, trauma and getting older. It’s what happens when nostalgia is haunting and broken. Gillen fittingly described DIE as “Jumanji as horror,” as the experiences in the game clearly screwed with the lives and psyche of all the participants. You feel the group’s pain when the game calls for them again. They can’t escape it, even if that’s all they want to do. Meanwhile, Hans’ interiors really shine. Known for doing brilliant cover work for series like Marvel’s Ms. Marvel and DC’s Bombshells United, DIE gives Hans a chance to show off magnificent interior work. She draws a grim, damaged world with characters showing genuine emotion, whether it be frustration, sadness, or anger. She really brings them to life. You feel for the trapped – both inside and outside the fantasy – characters. In the fantasy world of DIE, Hans encapsulates a sprawling, seemingly decrepit world full of intrigue. The costumes, weapons, and general looks of each character are imaginative. Clearly, Hans and Gillen loved fantasy and tabletop RPGs, because there work really shows a passionate understanding. For those who haven’t played RPGs or tabletop games, DIE is still incredibly accessible. Despite grand aspirations, decade-spanning storytelling, and fantasy world-building, the plot is fairly straightforward and the characters are distinguishable. Future plot points are set in motion which will immediately get readers hyped for the next issue. If you love fantasy, you’ll love DIE. If you don’t, it’s not going to prevent you from doing so. I promise I’m not being hyperbolic when I say there’s good reason to believe DIE has the potential to follow in the footsteps of Saga, Invincible, and The Walking Dead to become an instant classic for Image. It’s Gillen and Hans – two of the best in the comic business today – working together a genre they’re both passionate about that’s sure to resonate with many. At the very least, it will make you feel something. 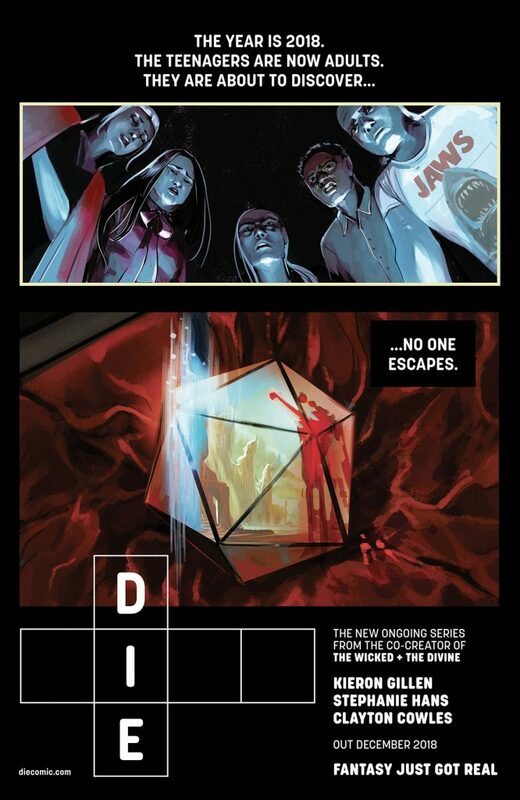 DIE is written by Kieron Gillen, drawn by Stephanie Hans and lettered by Clayton Cowles. The book is published by Image Comics and set to be released on December 5. Image Comics provided an advanced review copy of the book to The Comeback.